Vitus Commentary: @mileskimball: Which party do you think has better proposals? 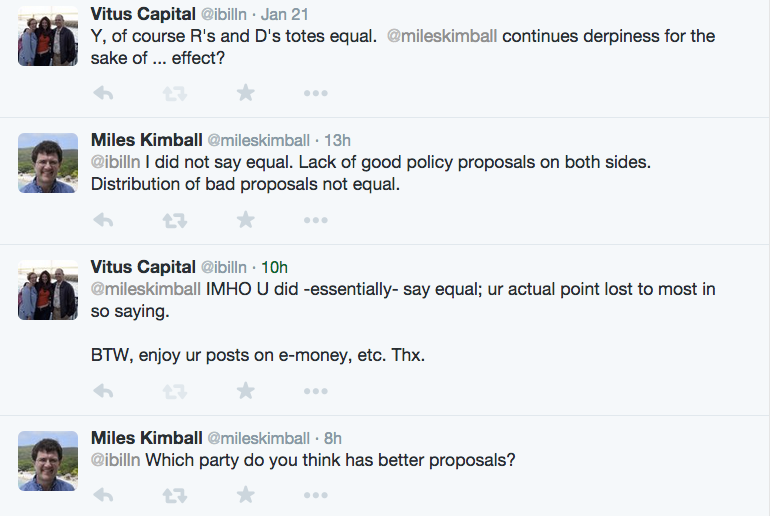 @mileskimball: Which party do you think has better proposals? Of course I said "D's". But then... Dr. Kimball is not dumb - he is no doubt asking in good faith, or something there akin unto. I decided to write a few things down and send this blog post to him. Maybe I'll learn something! Maybe he'll ignore me. R's have no national healthcare policy other than to do away with the D's one, the ACA. I think maintaining and strengthening the ACA is better policy than killing ACA. R's policy on money center banking is to repeal Dodd-Frank. D's policy is to continue to develop and enforce Dodd-Frank, keeping in mind how out-of-control the banking sector got in 2006-2010. I think that the US banking sector should be viewed as always by it's nature on the brink causing international financial turmoil*. R's policy on taxation at a national level is to implement the most regressive tax possible, from Steve Forbes' Flat Tax to the Ryan-Romney plan of a 20% tax cut across the board. These plans will be paid for by unspecified mechanisms. The D's tax plan is, briefly, to increase the capital gains tax from 20 to 28 percent, and use the money to help pay for a range of benefits for low and middle income people, such as moderate tax credits for education and child-care. I am against policies which specifically are non-specific about how they pay for themselves; I am for policies which further the well-being of Americans at reasonable costs. A final example I'd give for now is higher education. America's Research University is the envy of the world, but has been under attack from Republicans for decades. 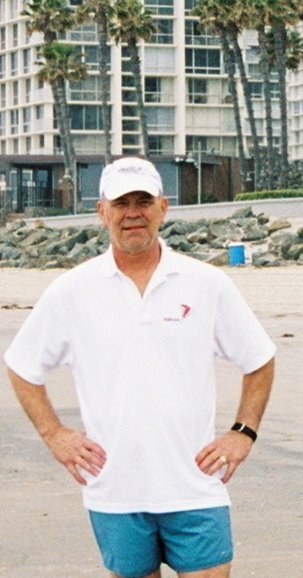 I, myself, started my journey from republican to democrat because of Reagan's attempt, when he was governor, to cut the budget of UC Berkeley by 10% unilaterally. A good discussion of the Research University issue is here. Dr. Kimball should know about this situation, being a tenured professor at a prestigious university. If he does not, or if he finds some sophistic way of explaining away what is clear on it's face, then he should be ashamed of himself at least. In general, there is no act or policy of Republicans which has been stated or proposed since Nixon expanded Social Security and Medicare in 1969, which is not directly, purposefully, and defiantly positioned in a veritable elysian field of a US Tragedy of the Commons. Four of the original states in the United States call themselves Commonwealths. So far we have come. * I don't have time here to give a history of US banking. This blog has many examples of the failure in the 2000's of US Banking to be congruent with any concept of social relevance.